The other day I was looking for something in my cabinet and came across this old Liberty House ad in the Star Bulletin newspaper. It was dated back in 1988 and in the front section of the newspaper. I actually forgot that I kept this. 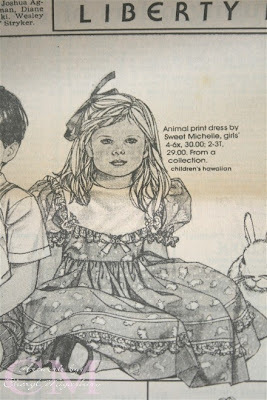 This is a picture of one of the dresses that Liberty House picked up for their Easter ad. And yes, I remember making hundreds of them. This is what I did before becoming a sales rep and before making paper crafts. I designed dresses and sold them to Liberty House. I think I still have a sample of this dress somewhere in my house. LOL! Anyways, I thought it would be fun to share a piece of my past with you. Here is a card that I made this past Saturday. I just had to have this new reindeer punch from EK Success which I got from the store. Isn't he cute? The only reason why I made him red was when I first took the punch out, I grabbed the first piece of cardstock in my scrap pile. I didn't want to throw it away so I ended up using it. This is the first time that I am using this Spellbinders borderbilities die. I like how it just cuts only 1 side of the edge. There is another matching border die in this set that actually cuts out the whole border. Well, hope you all had a great weekend! I got a lot of scrapbooking done. I am such a slow scrapper that I only made 4 pages but at least I am getting closer to the end of the album. Thanks for stopping by today and before I forget, I will be at the store doing a make & take this coming Saturday from 10-12 pm. Have a great week!!! Cheryl this is too cute! Wow, what a blast from the past, yeah! I also love gingerbread house that you made too! So cute! One of these days I'll make it to your make and take at the store. 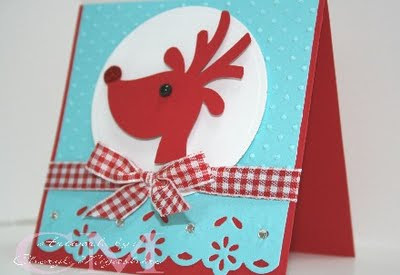 Great reindeer card too! TFS! 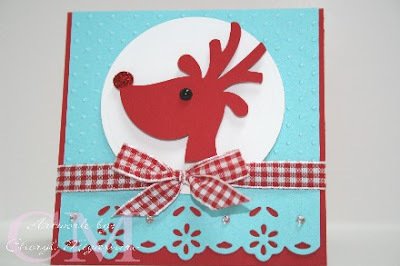 Cheryl, I love the color choices and layout of the reindeer card. I'll be looking for the new punches now....and more space in my craft room. I'm impressed with your sewing skills. OMGosh Cheryl, You are so talented!! That is one very pretty dress & I love that reindeer card. Have a nice week! Love the little info from the past...gotta scrap it! OMG, now i have to get this punch and border...not supposed to be shopping when I'm on a furlough! I guess gotta cut something else out, ha! !